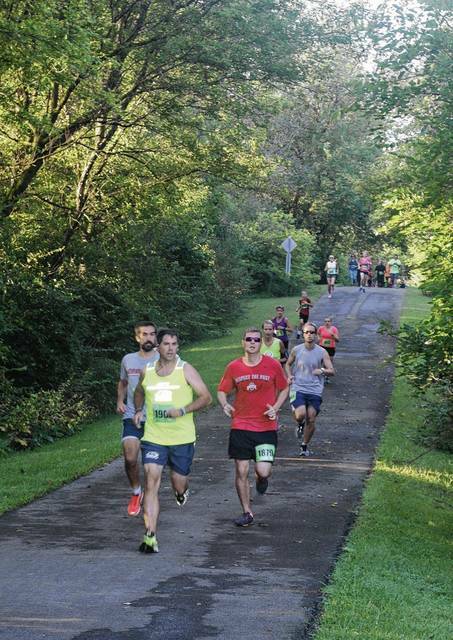 Runners in a previous Serve A Soldier 5K are on their way to Melvin Miller Park on the Simon Kenton Trail after starting at the Champaign Family YMCA. Registration is open for the 2017 Serve A Soldier, to be held Saturday, Sept. 2. The fifth annual Serve A Soldier 5K walk and run, to be held Labor Day weekend, Saturday, Sept. 2, in Urbana, will benefit veterans, active duty servicemen and women, and their families. The 5K will begin at 8:15 a.m. at the Champaign Family YMCA, 191 Community Drive. The early registration fee of $30 for individuals and $100 for teams of four (T-shirt guaranteed) is available through July 30 at keysports.net and through paper registration forms available at Urbana United Methodist Church, 238 N. Main St., Urbana (937-653-3741), and the Champaign Family YMCA. From July 31 to Aug. 19, the registration fee (with T-shirts guaranteed) is $35 for individuals and $115 for teams of four. Entry fee the day of the event, 7 to 7:45 a.m., will be $40 for individuals and $130 for teams (no T-shirts). Registration for children under 10 is free (without shirt). · Point Man International Ministries of Central Ohio, a nondenominational Christian organization that serves the spiritual and emotional needs of veterans and their families. Services include counseling for those encountering post-traumatic stress syndrome (PTSD). · Veterans of Foreign Wars Spriggs-Wing Post 5451 of Urbana, which will support the Fisher House, which provides housing to families of veterans and active duty personnel while being cared for at Wright-Patterson Medical Center; send care packages to deployed service personnel from Champaign County; and help veterans in need at Christmas. The race will start at 8:15 a.m., preceded by an opening ceremony at 8 a.m. to recognize the sacrifice of veterans. The course will be on the Simon Kenton Trail through Melvin Miller Park. Trophies will be awarded to the top overall male and female finishers and top three teams, and medals will be awarded to the top three finishers of each age group. The opening ceremony will feature remarks by Dr. Russ Clark, who was awarded the Bronze Star and Purple Heart for his service as a Marine in the Vietnam War. He was a platoon and company commander. A former pastor of the Urbana United Methodist Church, he now is a volunteer chaplain and counselor for Point Man International Ministries. He uses his experience as a survivor of post-traumatic stress disorder to help other veterans. Color guard of the Veterans of Foreign Wars Spriggs-Wing Post 5451 of Urbana will open the pre-race ceremony, UUMC Pastor Jim Lillibridge will offer the invocation, and the Urbana High School marching band will perform the national anthem. For more information, visit the Serve A Soldier Facebook page.